Have you ever been able to achieve something you never thought possible, yet when you look back you realize that you always had the power to do it? Maybe someone else shared an idea with you that sparked something or offered their help to kick things off. It doesn’t matter what it is, but those moments of being able to harness your inner power to accomplish something are pretty special. As I write this, I’m reflecting on last week’s National Society of Genetic Counselors (NSGC) Annual Conference. I’ve been in the genetic counseling field for… cough… a while, and each year I note how this conference grows by leaps and bounds. This was also my first time being there as part of the ThinkGenetic team, which was fantastic. Still pinching myself to be part of this crew! My week started early, joining NSGC leadership as an incoming Board of Directors member. We kicked off our meeting with the question, “What keeps you up at night?” to break the ice and get those strategic juices flowing. Profound ideas and discussion came forward about the skills, challenges, and solutions genetic counselors bring to the table as our field moves forward. Really, we were being asked to harness the power already within us – and the entire NSGC membership – to do this important work. Listening to my visionary genetic counseling colleague and mentor, Elizabeth Kearney, in the packed room at the first plenary session of the conference, I noticed this theme again. 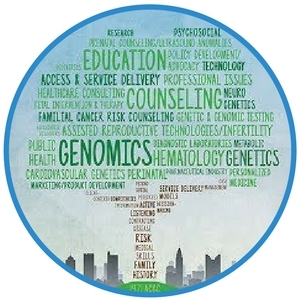 Liz urged all of us to flash-forward from the present and contemplate our role(s) as we continue “taking genomics mainstream.” Using concepts from the information technology space, she juxtaposed them with genetic counseling tenets (and they fit surprisingly well). She did this to help us to realize the power we already have to think practically about issues that haven’t even materialized yet, to ensure we’re ready for them when they do. Recognizing and channeling our inner power popped into my brain again as I listened to my fellow genetic counselor, the very talented Katie Stoll, discuss what she called “creative advocacy” (love that!) as she described how her company builds relationships with other healthcare providers to deliver genetic counseling services in Washington state. She posed this framework as a way to connect with key individuals – like primary care providers – to help us work together to navigate the evolving landscape of medical genetics. Once again, Katie asked us to channel the power within us to develop these relationships with others. And where did I see this theme again? Every time I talked about ThinkGenetic, of course. It’s what we do! How? It’s at our core. ThinkGenetic is the brain child of a patient advocate (Dave Jacob) and his genetic counselor daughter (Dawn Jacob Laney, my grad school classmate!). Between these two, they saw firsthand the power of the undiagnosed individual, patient, and clinician to navigate the (often) long journey that one takes to reach a genetic diagnosis. This led to the deep knowledge base you can sample at ThinkGenetic.com, which is always growing – even as I write this – thanks to wonderful genetic counselors and medical writers that contribute their expertise. Our latest project, SymptomMatcher, also taps into this concept. We have built it for the person who’s googling at 2am about whatever is bothering them about their health. Or maybe it’s the worried father, grandmother, mother… People are doing it, and spending hours on it. And everyone has the drive and power within them to get to the right answer. They just need help to channel it. SymptomMatcher is that help. It’s an online module that guides someone, step-by-step, through a self-assessment for signs/symptoms of different genetic diseases. Our custom algorithm works through each data point in the background to accurately make symptom-disease matches (insert shout-out to our incredible IT team here). At the end, SymptomMatcher offers a list of possible genetic explanations for what the person entered, which they can then take to their doctor or healthcare provider to discuss. This could lead them to the right diagnosis, sooner. And guess what drove the whole process? The power the person already had. We just helped them channel it. I remind myself of this as I say it to you: Don’t underestimate what you can do. You never know what you can accomplish using the power within you – now, or perhaps with the right guidance to get you there. Deepti earned her Master’s in Human Genetics/Genetic Counseling from Sarah Lawrence College in 1999. She is a highly skilled writer and editor with medical communications and marketing experience, as well as 15 years of clinical acumen as a certified genetic counselor across many medical specialties in two countries. Deepti is thrilled to be part of the ThinkGenetic team and help families with genetic conditions. When not doing this, Deepti is often poring over cookbooks, being grilled by her sons on superhero factoids, or writing about her family’s foodie gene on her blog. 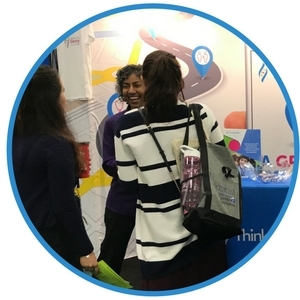 It was such a joy to have the opportunity to chat with you at NSGC this year, Deepti. Thank you for all you’re doing for the field and for patients. Congratulations on the incoming board position! Its amazing how a selfish idea – what’s wrong with me and how will it affect my three children and five grandsons has grown into a vision of helping 300,000,000 others going through a similar genetic journey. It took me 60 years to get diagnosed by growing my own genetic counselor and listening to her advice, testing and various hospital visits and I want to speed the process for others. Attracting incredible talent, like Deepti, who share my vision and make it a reality is so much more than I ever imagined.